There have been numerous different “cheats” and workarounds published on the web on how to use a set of DB Products (now DBSpectra) DB4060 and DB4062 duplexers which were manufactured for frequencies other than the Amateur Radio / Ham band on 2 Meter ham repeaters. We’ve probably seen all the same “tricks” you have seen, and by and large they are all compromise solutions which don’t result in very good performance and — in some cases — can result in costly damage to the duplexers and radio equipment, not to mention frustrating down-time. 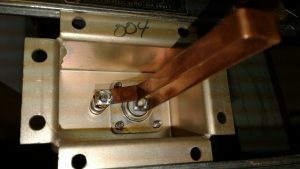 The bottom line is this: if the loop assemblies (more specifically the copper loops inside the enclosures) are not correct, they won’t perform to factory specifications of a DB4060 (4-cavity) or DB4062 (6-cavity model) with the “-B” model suffix. The “-B” model is a 143-156 MHz duplexer; however, most of what hams find for sale or salvage is the “-C” model, which was/is manufactured for 154-174 MHz operation. Trying to use a non-converted “-C” set for 2 Meter, 144-148 MHz purposes is a very good way to end up pulling your hair out. They won’t provide the factory-specification Return Loss (SWR), Insertion Loss, or the notching/isolation performance which Amateur Radio repeater owners are truly looking for. But have no fear — they can be converted to a -B set and meet or exceed factory performance specifications. DuplexerRepair.com offers multiple solutions for converting DB4060 and DB4062 duplexers to true “-B” models. Bring (or ship) the whole set to DuplexerRepair.com and we’ll do the conversion, inspect the cavities, completely overhaul the internal workings of the cavities if needed, do any other needed repairs, and convert the loop assemblies. 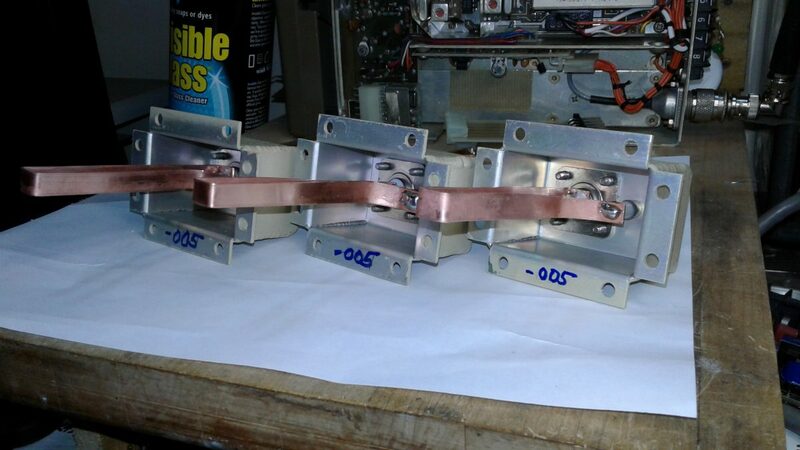 When we’re done with them, you will have a set of great working “-B” duplexers, tuned and ready for use on your repeater. Another view of loop enclosures which have been converted to -005 enclosures in the DuplexerRepair.com labs. replacement/conversion loops are made by hand right here in the lab. Depending on whether or not we have some already made up and ready in our inventory, it might take us a few days to custom fabricate the loops and ship them to you. 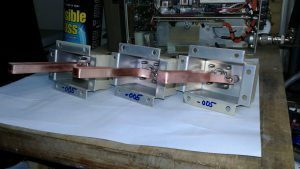 If you are interested in purchasing a set of replacement/conversion loops, sending us your loop enclosures for conversion, or bringing/sending your DB4060 or DB4062 duplexer set to us for conversion, just contact DuplexerRepair.com to make arrangements or to get more information. The cables BETWEEN the low pass cavities should be 10-1/2″ long (measured tip-to-tip of the N-connector center pins.) All other cables in the set (between the high pass cavities, and on both sides of the antenna TEE-connector to both branches) should measure exactly 10″ in length. Factory “004” loop enclosure, identifiable by the penned “004” on the bottom of the housing’s mounting flange. 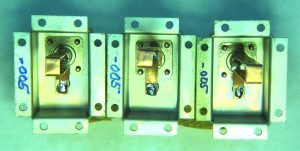 three digit number denotes which length copper loops were installed at the factory, thereby determining the pass and reject frequency range for the cavity/loop assembly combination. Herein lies the catch: dbSpectra (formerly db Products) starting stamping the assembly numbers on the outside of the mounting flanges of the enclosures at some point, but almost every set we’ve seen here in the lab pre-date that practice. On non-stamped enclosures, you have to remove the cabling from the loop enclosure, remove the eight screws used to attach the enclosure to the top of the cavity, then look at the underside of the enclosure. They marked them at the factory (sometimes with a permanent “Sharpie” type marker, sometimes with a pencil, and sometimes by just scratching the number into the metal. You will find either the number “-003,” “-004,” or “-005” marked on it. In order for it to be a “-B” set of duplexers, it has to have -004 assemblies on the low pass cavities, and -005 assemblies on the high pass side. Anything other than that means the set definitely needs to be converted. 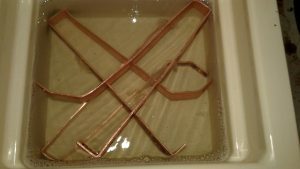 Custom-made replacement/conversion loops being ultrasonically cleaned prior to polishing and installation in the loop enclosures. ultrasonically cleaned, and polished before installation in the loop enclosure. When we do the full loop assembly conversion job, we clearly mark the new designator on the underside of the flange, and typically label the outside of the enclosure as well with the conversion date and the new designation number. If we replaced the capacitors in the loop, we like to mark that on the outside as well, including the date the capacitor was replaced. Repeated failure of capacitors — especially in the same cavity position in a set — is a sign that something else in the repeater/transmitter system may be occurring which needs to be corrected.